You’ll learn to build a responsive portfolio website from scratch. You will need a copy of Adobe Dreamweaver CC 2017 or above. A free trial can be downloaded from Adobe. No previous web design skills are needed. No previous Dreamweaver skills are needed. 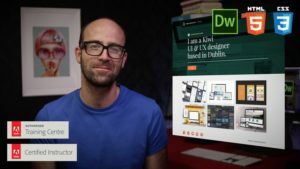 Hi there, my name is Dan and together we’re going to build a portfolio website using Adobe Dreamweaver. I am an Adobe Certified Instructor and better yet I work closely with Adobe themselves to develop their own online help videos. I am also a Dreamweaver speaker at the huge Adobe Max conference in Las Vegas. I’m even inside your version of Dreamweaver right now… go on try it… open Dreamweaver > Go to Help > quick tutorial – I’m right there! We will work with beautiful fonts & colours & even add Google Analytics to our site to get amazing information about exactly who visits your site. Now web design can sometimes be tricky so I am here to help – just message me if you get stuck. There are also exercise files so you can follow along. I even save a full copy of the website at the end of every video so that you can check yours again mine if you’re is not working quite right. Let’s get excited about finally being able to build a website like a professional web designer. See you in class. Thanks admin, you did the upload for me. Am super excited that my first request has been granted. Big thanks to you guys.